Matthew Hunt describes the swamp as ‘the sinkhole of our minds’.1 It is an evocative image, and one that relates quite deftly to aspects of his working practice. Hunt works intuitively, filtering sites, words, objects and liminal spaces to reveal unexpected poetry. Using any means necessary—video, performance, textas or sprouting potatoes, he attempts to decode his position in the world, critically, politically and philosophically. Ideas in his work that begin life as personal or private observations often grow, however, to address much broader, perhaps even anthropological, questions. The artist states, ‘my work is not above the audience, but a part of them’.2 In particular Hunt is fascinated by the implications of forgotten or failed places—from suburban bushland or semi-abandoned parks, which he documents in photographs and videos like a frontier fieldworker, to the expanses of outer space, the inspiration for a series of papier-maché meteors. 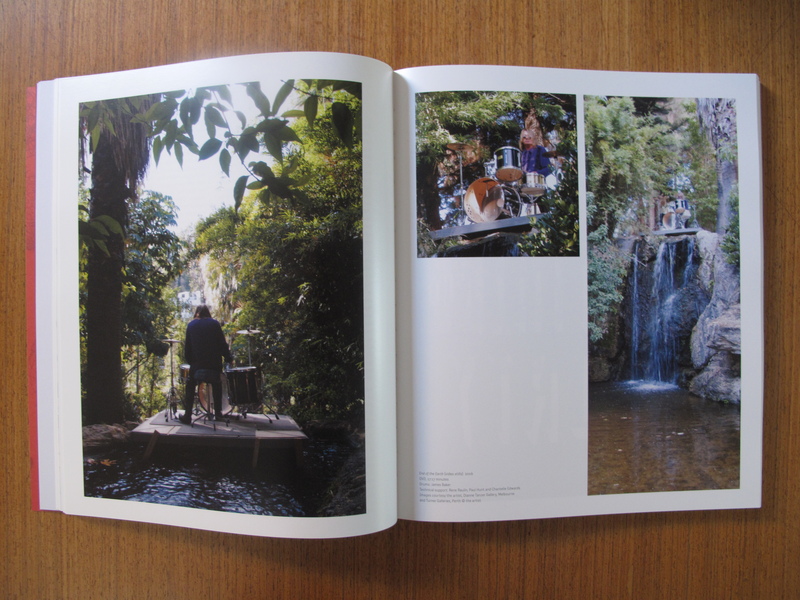 In the video work The End of the Earth (2006), Hunt stages an intervention atop a man-made waterfall in Perth’s John Oldham Park, an area of reclaimed swamp land constructed in the 1960s by the notable modernist town planner and architect John Oldham. The park is flanked by motorways and neglected by residents, an unfortunate departure from the utopian vision of picnics and promenades predicted for the site in the idealised artist impressions. Hunt invited James Baker, a quintessential ravaged rocker who has drummed for numerous bands, most notably The Hoodoo Gurus and The Scientists, to deliver a drum solo for as long as he was able from a small platform, built by the artist upon the park’s waterfall. The absurd vision of a man serenading a construction of ‘nature’ with a pounding drum beat, despite his energy and volume, seems perpetually lonely. The repetitive sound is a bleak augmentation of the ceaselessly falling water and passing cars, and it dawns on us that this place is here all the time, never reaching its planned crescendo. Hunt creates discernable pauses through his work. In a 2004 video work, Nightsky (2006), he filmed the sky as dusk moved into night. By observing the passage of the stars across the frame, he was able to contemplate the ‘speed of the rotation of the earth, the same speed as I am moving when standing still.’3 One evening he witnessed a large meteor burning a path across the sky, and he managed to capture its journey on video. This macroscopic event led Hunt to his shed where he began to construct a series of meteors. There are some wonderful images in one of his ’zines of droopy balloons and messy papier-maché as he tries to create the impossible—an earthbound metaphor for a moment of inspiration; a lightening bolt; a sign of life. By then naming them Ol’ Smokie, Apache and Ball Breaker ’87 (names sourced from trucks the artist passed while cycling to work) he drags the otherworldly back to the local, and highlights the tendency to tame the world around us through colloquialism, fantasy and humour. This exploration of language is particularly relevant in the word play that underscores Hunt’s ‘scraperboard’ series. The artist isolates words and phrases and scratches them out of a scaperboard in a multitude of typographic formations. The referents are collected from everyday life, from signs, lyrics, conversations, insults, but via their typographic treatment and ambiguous provenance, the ordinary becomes strange, doors open and meanings shift. Bean Counters (2009); Knuckle Head (2009); Ear Marks (2009); and Meat Axe (2009), have elements of humour, but also of menace. There is a materiality to these surfaces, like the pock-marked history of a school desk. And as with graffiti, the story is left for us to complete. Hunt’s floating narratives illuminate sets that we might see ourselves in, moving while we stand still. 1. Matthew Hunt in Backwater, self-published, Australia Council for the Arts, Sydney, and Arts WA, Perth, 2006, p.83. 3. Robert Cook and Matthew Hunt, Come on Feel, Acquittal Report, ’zine, Manilla Publishing, Perth, 2007, unpaginated.